I seem to have been hanging around the ‘Cultural Quarter’ a fair bit recently, but then it’s a happening kind of place. And when many of its delights are either free to everyone (library, art gallery) or free to those of us lucky enough to have a York Card (Yorkshire Museum) then the only barrier to visiting is having the time free to do so. After having tea with my mum, I passed by the museum on the way home, and called in to see the 1212 exhibition. It includes bosses and corbels from St Martin’s church on Coney Street. They reminded me that often the story behind exhibits is as interesting as the objects themselves. Maybe the ‘how they came to be here’ adds extra poignancy or a deeper sense of connection to our multi-layered history. 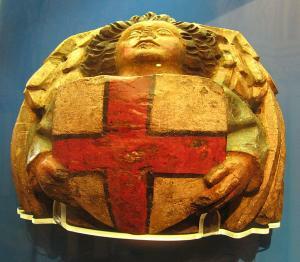 The wooden carvings, dating from the 15th century, were taken down during work on the church roof in the 19th century. I don’t know why they weren’t reinstalled, and whether they were immediately donated to the museum, or rescued by a local antiquarian, but it’s fortunate they weren’t put back. The church was badly damaged by bombing during the Baedeker raid in 1942. They wouldn’t have survived the fires. Now here they are, conveniently at eye level, so we can appreciate them perhaps more than our ancestors did. Complete with original painted decoration. Also on display just outside that room is a silk cap worn by a woman more than a thousand years ago. It was discovered during the Coppergate excavations. Once green, apparently, it looks brown now, and the silk is worn away in places. Such a delicate thing, and its survival is again remarkable. It is displayed not flat, but as if around an invisible head, making me imagine that head, and the thoughts she had, and the world she knew. More brutal and difficult than mine, and with few possibilities for anything beyond day-to-day working, surviving, childbearing. Jewelled exhibits crafted from valuable metals may attract the most attention. But just as valuable, in my eyes, are these objects, carved from wood, woven from silk.